Charles Daniel was born on April 9th, 1862. Charles Daniel's father was Phaon Clauss and his mother was Luzetta Bauer. His paternal grandparents were Daniel Clauss and Judith Miller. He had a brother and two sisters, named John, Emma J. and Clare. He was the second oldest of the four children. He died at the age of 77 on May 12th, 1939. Clauss, Charles Daniel, son of Phaon and Lucetta (Bauer) Clauss, was born at Weissport, Carbon County, Pa., April 9, 1862. 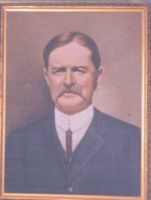 He received his preparatory training at Keystone State Normal School, Kutztown ; entered College in September, 1884, and graduated June 28, 1888. Ho was a member of the Euterpean Literary Society ; received honorable mention for German essay and for standing in his class at the time of graduation. In the fall of 1888 he entered the Lutheran Theological Seminary, Philadelphia, and graduated in May, 1891. On the 26th of May he was ordained to the office of the ministry by the Ministerium of Pennsylvania, assembled at Pottstown, Pa., and is now pastor at Stroudsburg, Pa. During the scholastic year 1887-88 he was one of the business managers of The Muhlenberg. Charles Daniel's occupation was Farmer (Fruit farm).